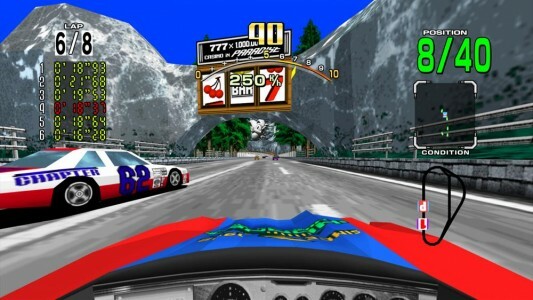 Daytona USA XBox 360 Review Overall, this is an excellent port; things have definitely come along way since this was first seen in arcades, some of the fundamentals of the game certainly still hold up to modern races, particularly the driving. 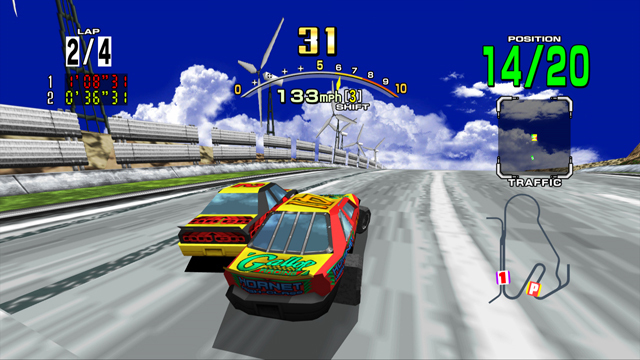 Nostalgia can get you along way with video games, take a look at Daytona USA, this latest attempt at porting the original arcade smash is by far the best effort yet. There have been virtually no tweaks to the original, and quite frankly, for this title is shouldn’t really be any other way, I know I wanted a nostalgic response to this game, and that is exactly what I got. There have been a some new modes added to the formula, there are missions that serve as kind of a tutorial, time trial and also a survival mode, here you must drive for as long as possible, however hitting other cars or walls makes the car more difficult to drive, and hitting cones gives you more time, it is a good mode that provides plenty of challenge for even the most experienced Daytona USA players. Gaming has come along way since this was originally seen in arcades, not everything holds up to modern racers but surprisingly, there are some aspects that still do. One huge area where comparisons to modern games sees the largest division is the graphics, graphically is game features huge polygons and seriously simplistic, albeit extravagant back drops. 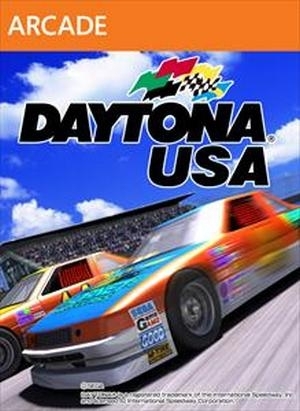 Fortunately for Daytona USA people will not play this game for awesome visuals, and the graphics do not take away from the experience anyway, I know personally I would have been more disappointed in this if they had reworked the graphics. They have however, increased the draw distances, which is a welcome change. The game retains it excellent and ultra arcade-like handling model, the controls have been carried over excellently to a game pad, never the same as sitting in the arcade but still thoroughly enjoyable nonetheless. There are only really two options for the driving, manual or auto, there are no fancy driving aids to assist, just straight up racing. 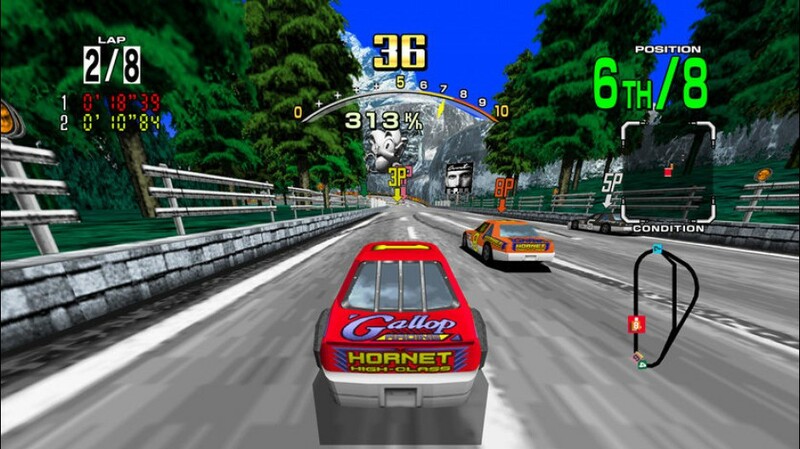 There are a total of three memorable tracks featured in Daytona USA, each of these also mirrored. This is not a great deal, but these are classic tracks and really, aren’t these the only three tracks that really matter when playing this. Sound wise, things are virtually unchanged, the sounds of these classic arcade games always seem to tickle the nostalgia bone, and again this something that is outdated, but I have little doubt that if they were changed there would be outrage. The cars and effects are all the same and are fine, they serve their purpose, and that seems to primarily be nostalgia. The presentation also remains unchanged, as has the all important commentator. Overall, this is an excellent port; things have definitely come along way since this was first seen in arcades, some of the fundamentals of the game certainly still hold up to modern races, particularly the driving. For those that spent their youth racing around these three tracks this is definitely worth a download, for those who love racing games and have little or no experiences playing this game, it is also worth a look just to see what was popular years ago.